What is Blue Link ERP? Blue Link ERP is a business solution with integrated accounting and inventory management modules. The Microsoft Certified partner is for the use of wholesalers and distributors that range from small to medium-sized. Blue Link ERP customers find that the software offers them great value due to its minimal cost and a wide range of features. On top of that, the ERP solution integrates with other platforms to provide businesses an interface where they can conduct various tasks at once. With Blue Link ERP, businesses are able to experience better operations management. The software’s integrated aspects allow them to wrap up their tasks faster without sacrificing accuracy, enabling people to be more productive and efficient. 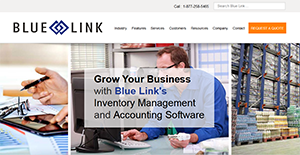 Blue Link ERP is a software that comes with accounting and inventory modules. This makes it a powerful solution that assists wholesalers and distributors in managing their businesses from all aspects from a single platform. The accounting module offers tools that make certain all accounts, whether receivable or payable, are logged and duly taken care of and that the employees are well compensated. Meanwhile, the inventory software makes certain that the business always has enough items of a certain good at hand to be able to continue providing customers with their needs. This way, they can earn more profits since there are no gaps in the supply and demand. Additionally, Blue Link ERP integrates with eCommerce platforms and online marketplaces. This lets businesses control orders and purchases from their web stores directly from the solution with ease while maintaining accurate data across the board. Blue Link ERP is a software that can be counted upon for a wide range of solutions. It supports multiple users and multiple companies for a more comprehensive operations management. Plus, the solution supports an unlimited number of currencies to better conduct transactions. Moreover, the application provides swift access to necessary information for inventory, accounting, and other related tasks to facilitate their speedy completion. Blue Link ERP can also be counted upon to show real-time information. This keeps users informed of changes in the system so they are continuously aware and therefore able to make intelligent and up-to-date decisions. Blue Link ERP has an open API that enables companies to create custom integrations. With this, businesses are able to complete more tasks and have a more integrated workflow. Blue Link ERP is not limited to its accounting and inventory modules as well as its third-party integrations. The application also has a number of optional components that enable companies to expand its use. By adding any one of these modules, they are able to complete more tasks just by using a single platform. It's important to keep in mind that almost no software in the Accounting Software category is a perfect solution that can match all the goals of all business types, sizes and industries. It may be a good idea to read a few Blue Link ERP reviews first as specific solutions can excel just in a really narrow set of applications or be designed with a very specific type of industry in mind. Others can operate with an idea of being simple and intuitive and as a result lack complex elements desired by more experienced users. There are also solutions that support a large group of users and provide a complex feature set, however that frequently comes at a more expensive cost of such a solution. Ensure you're aware of your needs so that you purchase a software that offers exactly the elements you look for. How Much Does Blue Link ERP Cost? Blue Link ERP’s enterprise pricing information is available only upon request. Contact the company for more details, and ask for your quote. We realize that when you make a decision to buy ERP Software it’s important not only to see how experts evaluate it in their reviews, but also to find out if the real people and companies that buy it are actually satisfied with the product. That’s why we’ve created our behavior-based Customer Satisfaction Algorithm™ that gathers customer reviews, comments and Blue Link ERP reviews across a wide range of social media sites. The data is then presented in an easy to digest form showing how many people had positive and negative experience with Blue Link ERP. With that information at hand you should be equipped to make an informed buying decision that you won’t regret. What are Blue Link ERP pricing details? What integrations are available for Blue Link ERP? Blue Link ERP also provides access to its API for businesses to create their custom integrations. If you need more information about Blue Link ERP or you simply have a question let us know what you need and we’ll forward your request directly to the vendor.